I have an 03 Springfield that has 5-30 stamped on the barrel. The serial number is(###) ###-#### It has AAE stamped in the stock. It has a canvas sling and also has no slot in the receiver for a stripper clip. What do you thimk it is worth ? Expert's Assistant: The Firearms Appraiser will get you a firearm appraisal. Is there anything else important you think the Firearms Appraiser should know? I'm not sure what else to add. Experience: Professional Gunsmith, Certified Police Firearms Instructor, Concealed Carry Instructor, Journeyman Machinist and Firearms Enthusiast. I have never tried to load it with a stripper clip, does have to have a guide there? With the stripper clip is loaded via a slot in the to of the receiver. Here is a photo that demonstrates how that works. Once you have read the answer below, you will be prompted to provide a positive rating (on your screen now with the stars) for my efforts in answering your question. If have answered all your questions and helped you, please rate my answer. I am not paid by the site until you do. It does not cost you anything more to rate the answer, and I will continue to be available if you have more questions on the item. Thank you. At the top right above our post are a series of 5 stars. I always strive for 5 star service, but please rate as you feel is appropriate. However, if you are considering a low rating, please try to give me the opportunity to improve my service to you first! 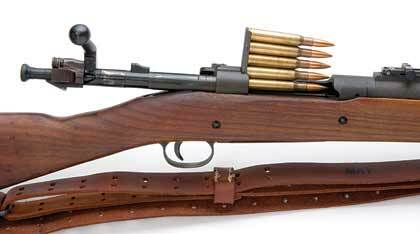 The 5-30 Making means this rifle was made in May of 1930. This is also confirmed by your serial number. I am not sure about the lack of a stripper clip slot. It seems strange however there were often things that were omitted to speed up the machining process. Here are the values for your Springfield 1903. Values below are listed by condition. The prices listed are retail prices. You can usually expect 25%-30% less than retail when selling to a gun shop or re-seller. Private party buyers usually pay prices closer to the retail value. Springfield 1903 from 1930 if in original (non modified condition). Please let me know if I have answered your question. If you need appraisals/estimates for anything else, please let me know. If you’d like to request me for future questions, please put " for Jon only" in your post. I respond to requested questions first. Please remember to rate this answer. Just trying to get a solid trade value three 1903 rifles.